An independent, female-owned-and-operated restaurant, The Herb Box is known for its innovative world cuisine, showcasing seasonal ingredients, with a menu heavily focused on healthy, veggie-centric dishes. Founded in 1995, The Herb Box has two successful Scottsdale locations. 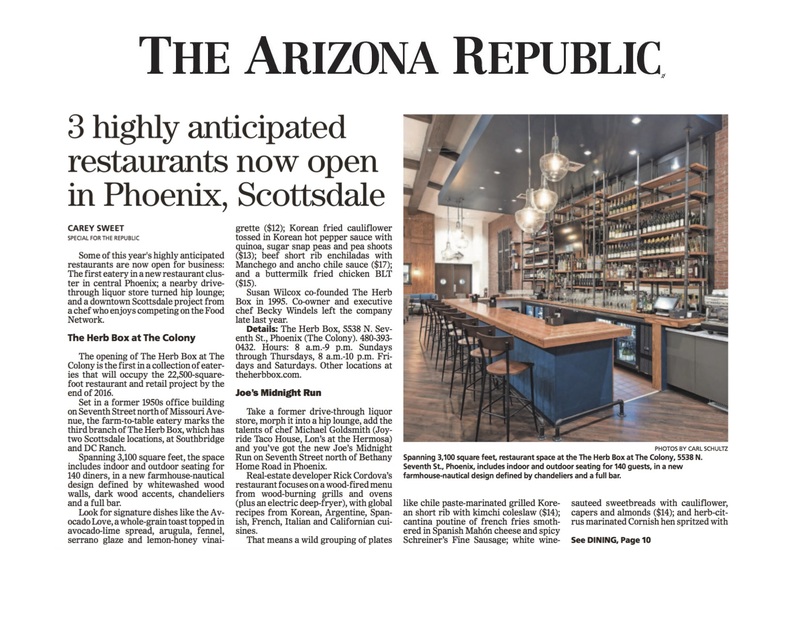 In April 2016, the restaurant expanded its footprint outside of Scottsdale for the first time, becoming the original tenant to open its doors at The Colony, a new mixed-used development in midtown Phoenix. The Herb Box is a well-established restaurant, with a loyal following in Scottsdale. It was unknown whether the brand would be as recognized in a new area of town. Additionally, the 7th street corridor in North Central Phoenix was seeing a huge boom in new restaurant openings. The Herb Box was just one of many businesses trying to create a buzz and attract guests. Due to the uncertainty with the construction schedule, Ampersand PR was tasked with creating and executing a media relations campaign in a very condensed amount of time of less than one month. In order to gain the most amount of buzz out of the grand opening of The Herb Box, Ampersand PR emphasized messaging that would make the restaurant stand out from their nearby competition: 1) The Herb Box was the first tenant to open in the mixed used development, The Colony, which in and-of-itself was garnering attention. 2) The Herb Box was an established, independently owned restaurant with two existing, successful locations. 3) The Herb Box caters to a health-conscious clientele and is accommodating to those with dietary preferences and food sensitivities. 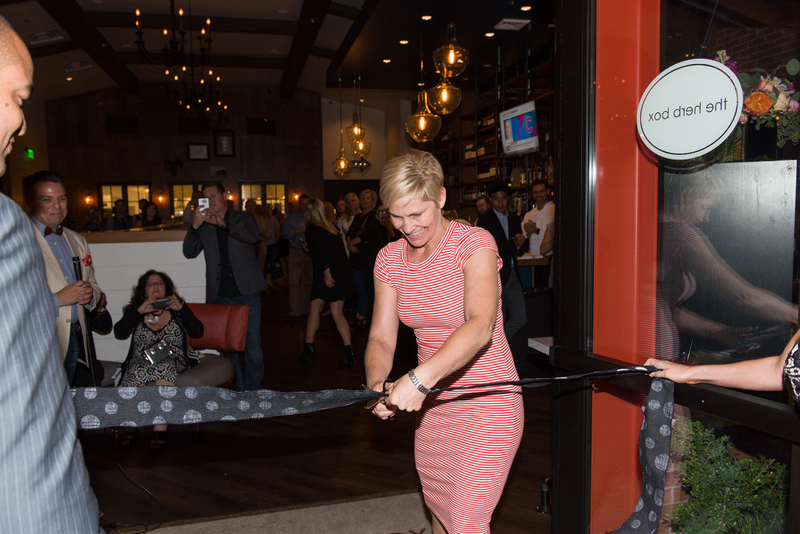 Aside from creating key messaging, Ampersand PR planned a media sneak preview event that preceded a grand opening VIP event, allowing media the exclusive opportunity to experience the restaurant before anyone else. The Opening was a Success! More than 30 media attended the sneak preview event. Ampersand PR created a social media card that was positioned at each place setting. This resulted in concentrated social media buzz prior to the restaurant opening. Additionally, the media preview resulted in numerous media placements in the four months following the opening. In the several months surrounding the grand opening, more than 45 placements were secured in numerous online, print and broadcast media outlets, including a full page feature in Uptown magazine, a review on AZ Foodie, a two-page spread in ION AZ, multiple grand opening articles and food features in The Arizona Republic, as well as segments on FOX 10, KTVK TV-3, and ABC’s The List.